Tom Prichard Contracting Limited take delivery of additional Scania construction vehicles supplied by Keltruck Ltd.
Tom Prichard Contracting Limited have taken delivery of two additional Scania G410CB8X4MHZ construction vehicles complete with Thompson muckaway tipper bodies and Thompson sheeting systems – all supplied by Keltruck Ltd, Scania dealership for the Midlands & South Wales. For added safety the vehicles have been fitted with a passenger side ‘Vision Door’ designed and installed by Keltruck to give the driver a valuable line of sight to potential cyclists or hazards on the nearside of the vehicle. In addition the vehicles are equipped with the latest side cameras, side sensors and an audible alarm for cyclists and pedestrians when the vehicle is turning left. Tom Prichard’s drivers have offered great feedback on the improvements this has afforded them in terms of vision and awareness in urban centres. There are a total of 400 plant assets supported by a 25-strong truck fleet which is 100% Scania including a new 4×2 Skiploader, a beavertail, four dedicated contract vehicles, 16 rigid and 5 articulated trucks. Tom commented that he receives a great level of service, support and backup from the local Scania dealer, Keltruck Ltd, which stems from vehicle and parts backup to specialised plant technicians arriving on site when required for vital updates and servicing on the Scania powered plant equipment including a new Terex Finlay J-1170 and existing Terex Finlay J-1160 stone crusher. 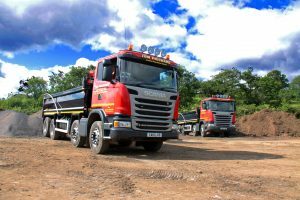 Tom has a further two new Scania 8×4 tippers on order for September as well as two further orders secured for 2016 with Keltruck to assist his expanding business and continues to use the services of Keltruck Ltd and Scania (Great Britain) Ltd for vehicle supply, parts, maintenance, support for Scania industrial engines and Scania Finance as the relationship continues. 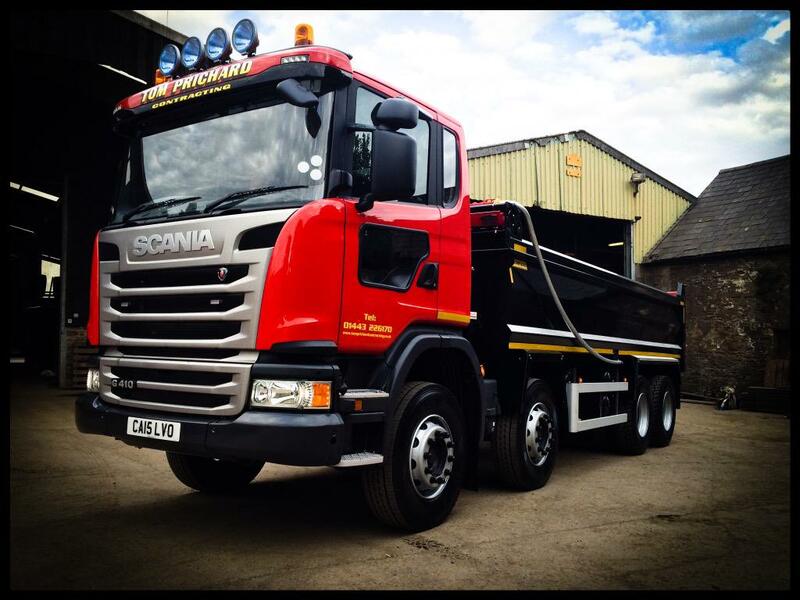 Purchasing decisions are made at Tom Prichard Contracting Limited with reliability, dealer support and whole life costs in mind.